Bakers Waste Services was established in 2002 by Paul Baker (Managing Director). With the continued success of Bakers Waste Services Limited we are proud of our ever growing headcount (which currently stands at over 100 staff – ranging from drivers of all types of vehicles, consultants, various members of office staff) and our continued expansion and growth plans. Since 2002 we have rapidly expanded our customer base within Leicestershire and the East Midlands to over 5,000 customers. Operating a comprehensive fleet of over 50 vehicles including trade waste vehicles, Front End Loaders, skips, roll-on-offs, clearance services, confidential shredding, food recycling and more! We have expanded our operations to include multiple recycling facilities to offer our customers more environmentally friendly alternatives for the disposal of their waste in order to reduce waste to landfill. We have dedicated sites that are specific for handling different types of waste streams enabling us to achieve phenomenal recycling figures. With residual waste going for waste to energy (WTE), refuse derived fuels (RDF) and micro biological treatments (MBT), with only a minimal amount of the waste we handle ending up in Landfill. We pride ourselves in our service levels and recycling figures ensuring that we are the leading Independent Waste Management Company in Leicestershire, Northamptonshire, Milton Keynes and beyond! Our customers include Leicester Tigers, Leicester Racecourse, Pubs, Schools, Colleges, hospitals, as well as Official Waste Partner; Leicester City Football Club. Bakers Waste is proud of its achievements, such as having an ISO14001 certified Environmental Management System for reducing its environmental impact on the environment. 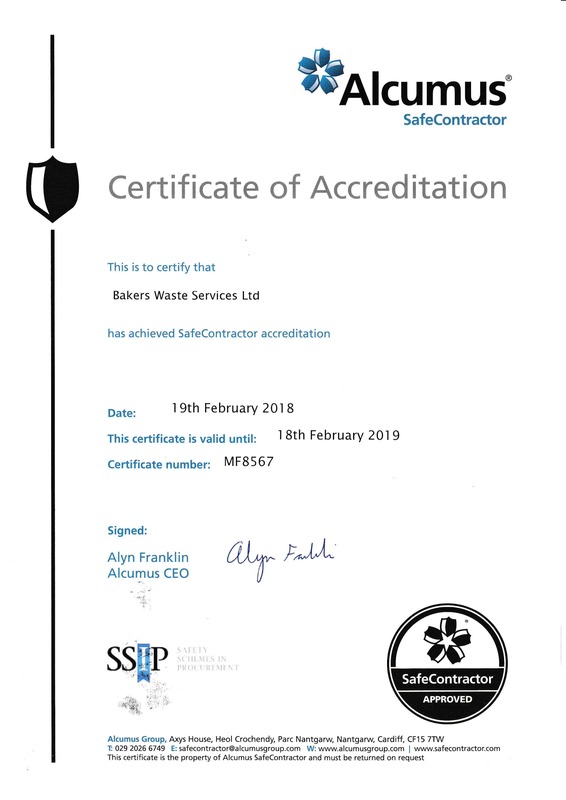 In addition Bakers Waste are a long-standing member of the Safe Contractor Scheme where being a member means that you have to be compliant with stringent health and safety standards.